Whether you have planned all the details and simply want us to pull it all together...or have just said "Yes" and have no idea what to do, we can help. 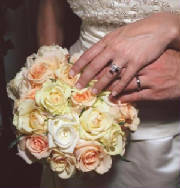 We'll make sure you wedding day or special event is everything you have ever dreamed of. * Day of Event On-site coordination - making sure everything goes smoothly so you can relax and enjoy your day. Whether you want your occasion to be large or small, simple or elaborate, traditional or contemporary, you can have peace of mind knowing that we are by your side making sure all the details are handled beautifully. Now sit back, relax...and let us get "Down To Details", because details are what we do best.